← Massillion, Ohio. February 28th, 2011. Cape Town, South Africa. February 27th, 2011. 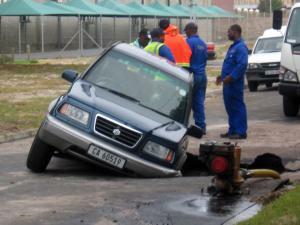 Four people were injured when their car plunged into a sinkhole in a residential street in Southfield in Cape Town. A water pipe that burst early yesterday left a hole 3m wide and almost 2m deep. A car travelling on Princess Vlei Road shortly afterwards plunged into the hole, leaving the driver and one of his three passengers injured. A Southfield resident, who declined to be named, said she had spoken to one of the passengers who stayed with the car. “She told me it was still dark and they were coming home from a function,” said the resident. About an hour earlier, another car reportedly also drove into the hole and was towed out. Residents said there had been no warning signs. But Farouk Robertson, spokesman for the City of Cape Town’s water and sanitation department, said they had been informed of the hole only shortly before 5am, after the second car plunged in. Fed-up residents said pipe bursts in the area were frequent. This entry was posted in Pictures, Vehicle v Sinkhole and tagged Cape Town, sinkhole, South Africa. Bookmark the permalink.